Leech is one of those figures that that is permanently etched in my memory. I got Leech and Mantenna for Christmas of 1985 (my brother got Grizzlor). At the time I was just starting to get distracted away from Masters of the Universe by G.I. Joe. I remember my cousin making the argument that G.I. Joe was cooler than He-Man because you could “put them in better poses.” I wasn’t terribly interested in army toys, but I looked up to my cousin and was easily swayed by his opinions. 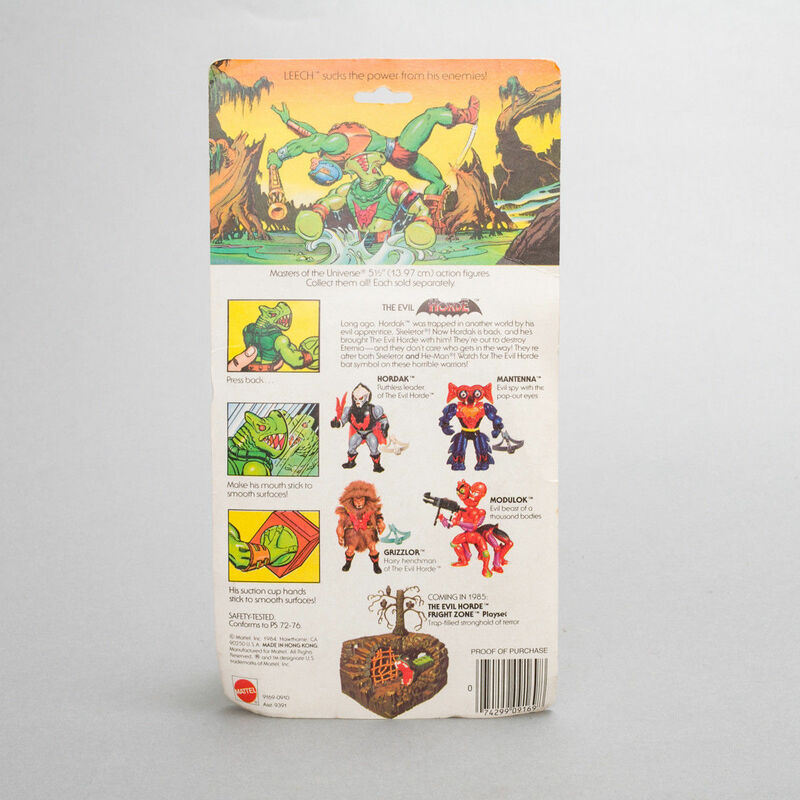 By 1986, Hasbro was putting out G.I. Joe figures that were much more colorful and weird, maybe in an effort to attract the attention of He-Man fans (it certainly worked on me). In any case, getting Leech and Mantenna sucked me right back in to the world of He-Man. 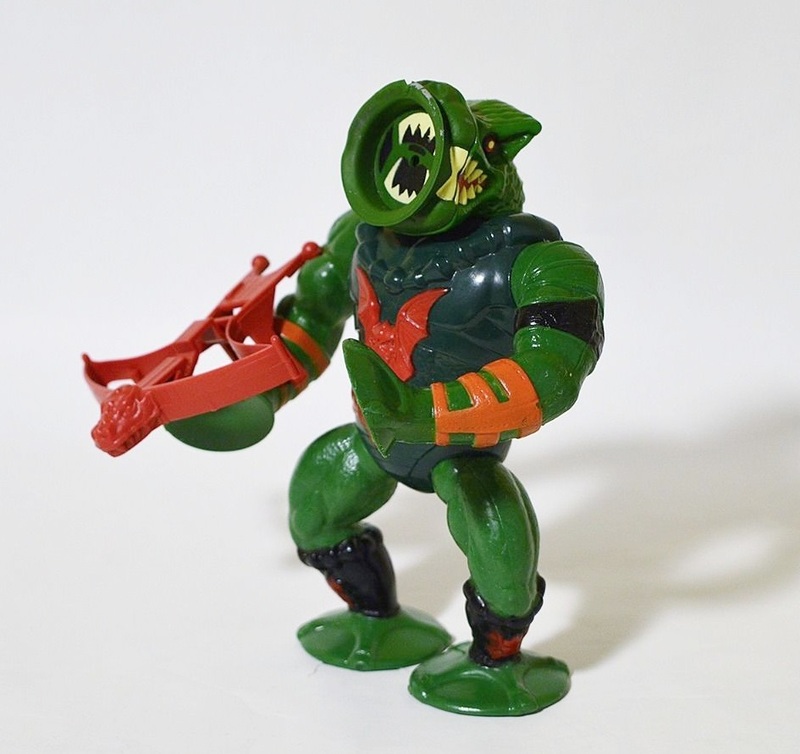 Masters of the Universe had long been a toyline filled with colorful, freakish monsters, but the Evil Horde took the bizarro factor to a whole new level, and Leech was an instant favorite. 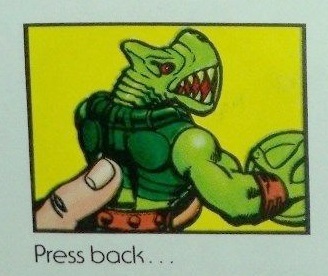 An evil green monster with suction cups for hands and a suction cup mouth? Sold! 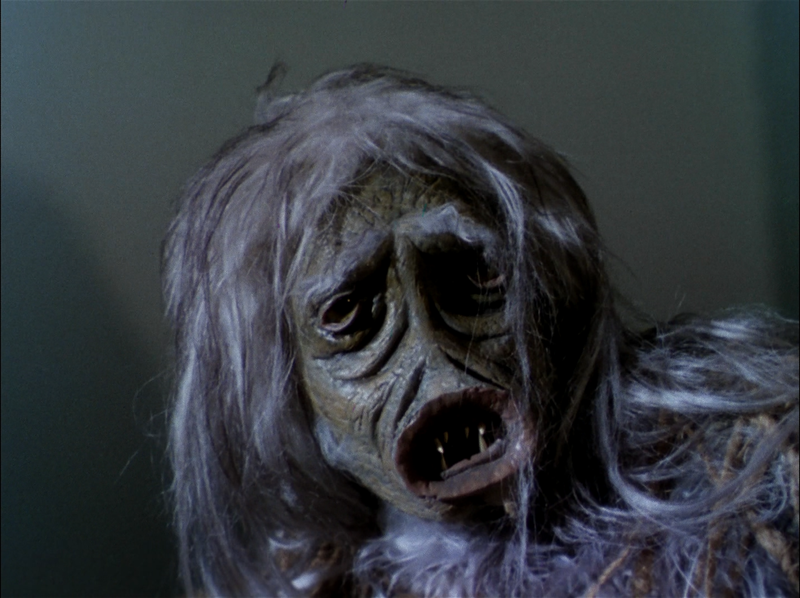 Leech reminded me of the salt vampire from the original Star Trek series – the creature also had a sucker face and suckers on its hands. That episode gave me a serious case of the creeps as a kid, so to have something a little like it in figure form was thrilling. There are a couple early concepts for Leech, one from Filmation and the other from Mattel. 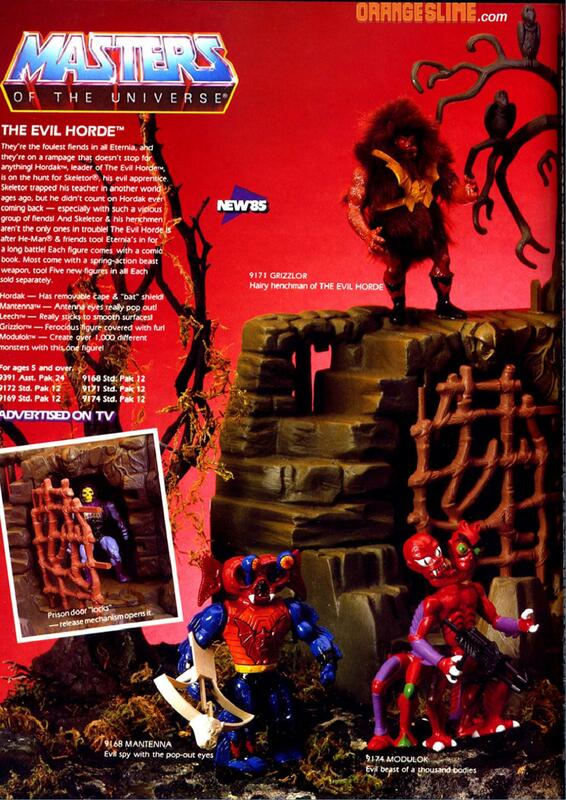 My understanding is that the Evil Horde concepts originated from Filmation, and Mattel took those concepts and often took them in a different direction. Back at Mattel, designer Ted Mayer took the concept in a much different direction. Ted’s concept (below) presents a character that is much more alien looking, with more prominent suction cup hands and a face also dominated by a giant suction cup. Leech’s limbs here are much slimmer than the actual figure, but this design is otherwise much close to the toy design than the Zembillas drawing. As noted in The Power and the Honor Foundation catalog (image above), the Horde insignia on Leech and the rest of the Evil Horde was originally envisioned as an alien creature that controlled the actions of these monsters. It was an interesting idea, but was ultimately dropped. 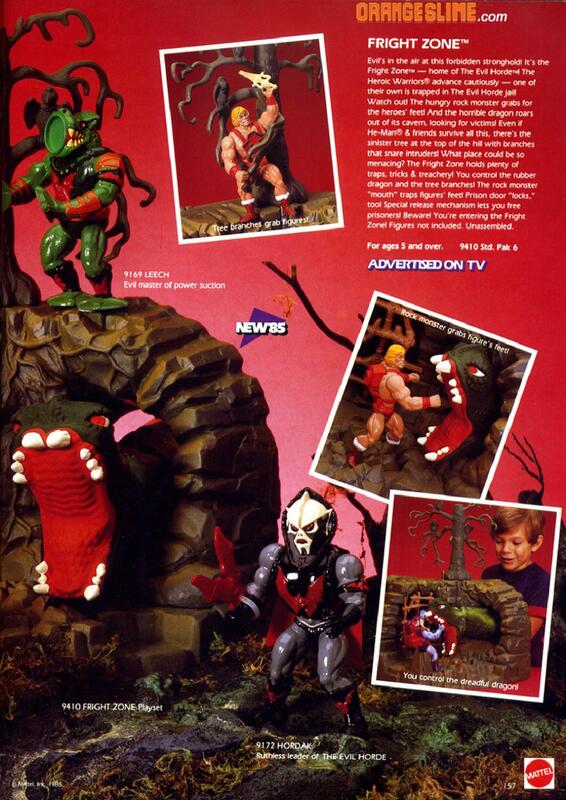 This close to final prototype (sculpted by Eddy Mosqueda, who also worked on Grizzlor, Sssqueeze and Eldor) appeared in the 1985 Mattel Dealer Catalog. The sculpt is final, and the figure appears to be hand-painted. 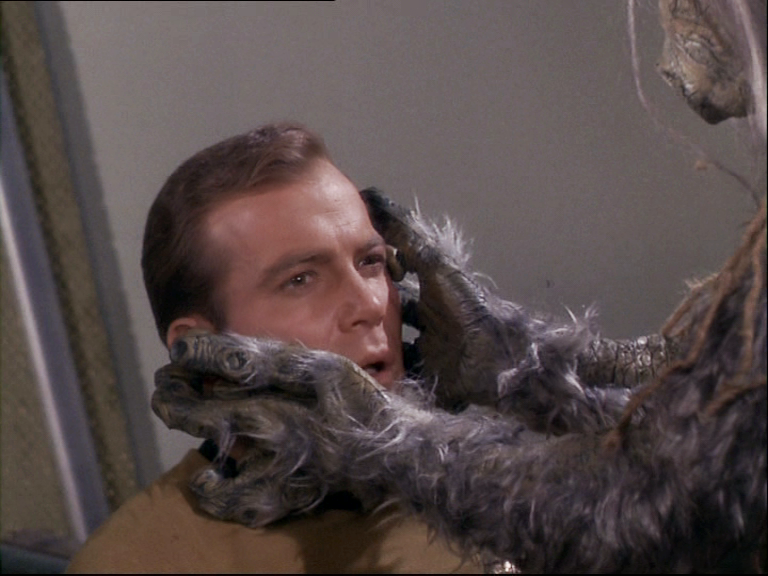 As you can see, the prototype lacks the painted teeth on tongue inside his suction cup face. The suction cup itself is shallower than the final version, and lacks the wide rim on the toy (thanks to Manic Man for pointing that out). Unlike the final toy, the armor covering his left shoulder is painted orange, and the Horde bat insignia on his left arm is painted red. He also has black nostrils. 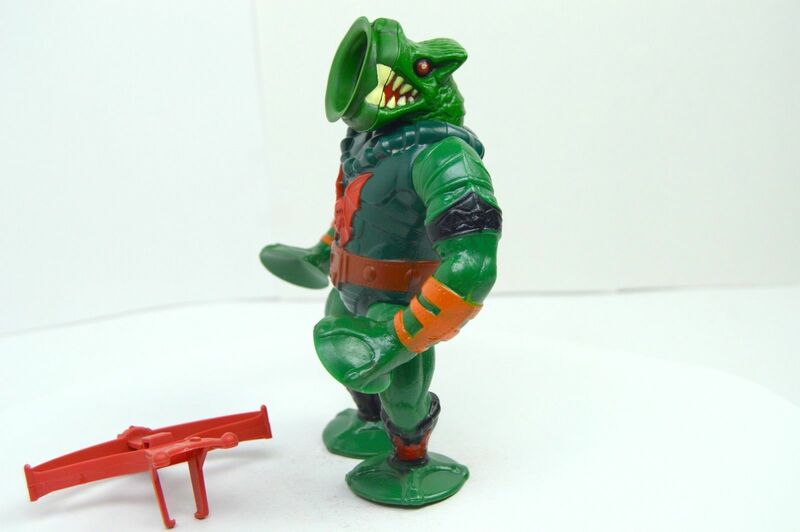 Compared to most other MOTU figures, leech was much more solid and bulky. His action feature required a fairly large torso. The suction cups on his hands (which never seemed to work all that well) were typical suction cups other than the sculpted finger details, but the suction cup on his mouth actually had a hole in the middle of it, with a tube leading down to a rubber bladder in the center of Leech’s torso. A button on the figure’s back would force the air out of the bladder through the hole in Leech’s mouth. This would create a vacuum in the bladder, resulting in a stronger suction force to better keep the figure attached to smooth surfaces. In this scene Man-At-Arms is holding Mekaneck’s club. Leech is based on his prototype, with black belt buckle and painted orange shoulder armor. Aside from his single carded release, Leech was also sold in a J.C. Penny two-pack with Mantenna. There was also a planned three-pack with Hordak and Mantenna, but as far as I know no one has seen one in the wild. 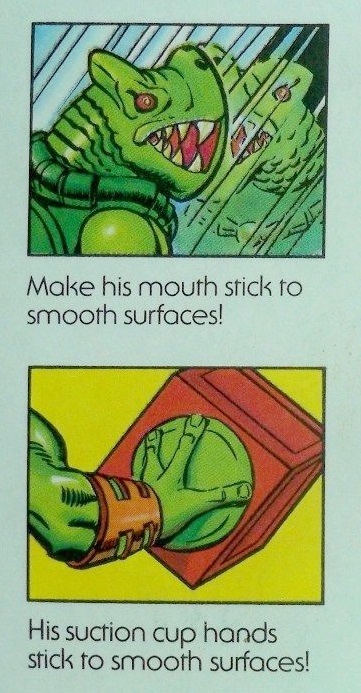 The mini comic that came with Leech is no doubt the strangest piece of the entire series. In the story, Mer-Man (who is inexplicably bearded) is running from terror from Leech, who in this story is the size of the mountain, but has undersized two-fingered hands. 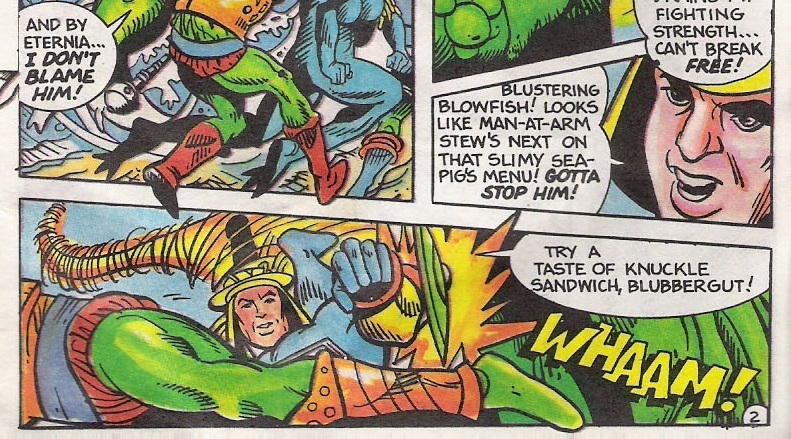 Sy-Klone manages to temporarily defeat Leech (delivered with one of the best quips of all time – “Try a taste of knuckle sandwich, blubber gut!”), and the heroes take the frightened Mer-Man back to the palace to discuss the new threat with King Randor (who for some reason has a pink beard here). As I said before, Leech is a giant behemoth in this comic. When he returns to Hordak empty-handed, it’s clear that Hordak is human-sized. However, when He-Man takes on Hordak in the Talon Fighter, Hordak is also giant-sized. Reading this comic as a kid, I assumed that both Leech and Hordak had the power to grow or shrink at will. I’m not sure if that was actually a power they were intended to have, or if this comic book can best be explained by the effects of a bad acid trip. Either way, I was left scratching my head. Still, for some time afterward I believed that Leech had this ability, and when I had him facing off against the Heroic Warriors, I would often pretend that he was a giant. I wasn’t aware until some time later that Leech was actually a frequent character on the Filmation-produced She-Ra cartoon. 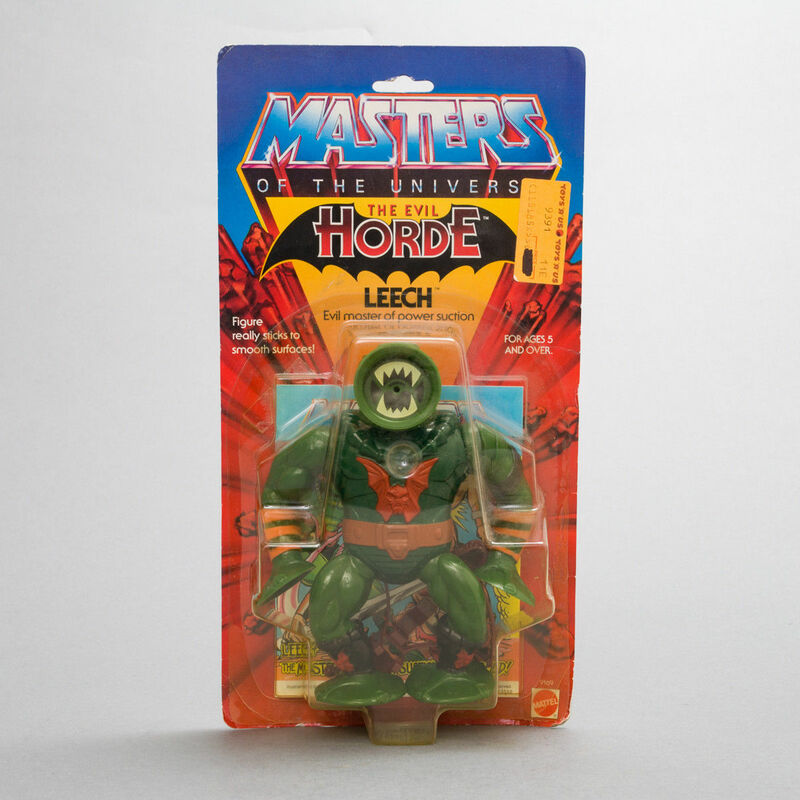 Certainly there was nothing on Leech’s packaging that connected him to She-Ra in any way. His appearances were enough to get me interested enough to watch a couple of episodes. It was fun to see Leech in action, but it was also tough as a little boy in the ’80s to admit to being into something that was branded for girls. 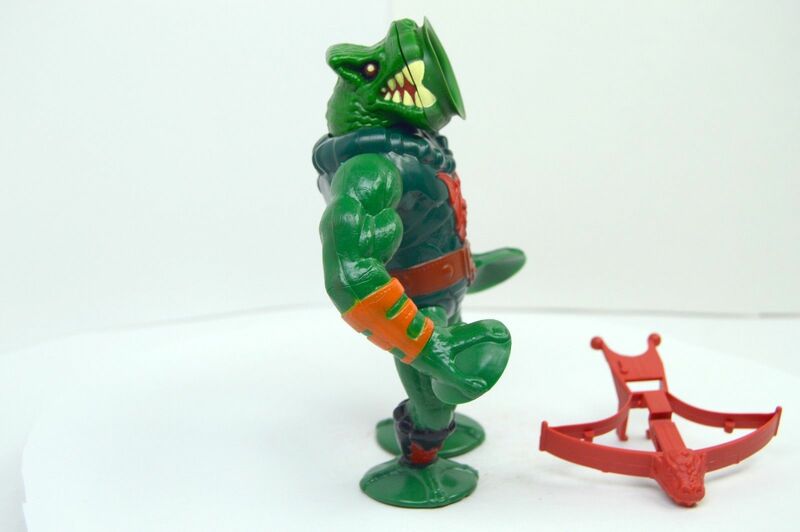 The Filmation version of Leech was a bit different from the toy version (and radically different from the Charles Zembillas concept). Compared to the toy he had a more realistic mouth, a yellow belt, and symmetrical yellow shoulder armor. 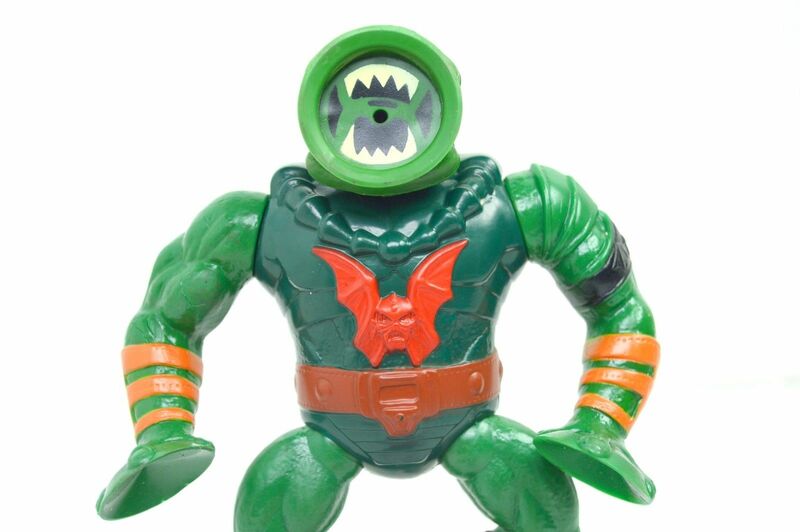 I won’t say that Leech is my all-time favorite Masters of the Universe figure, but he’s definitely in the top 10. 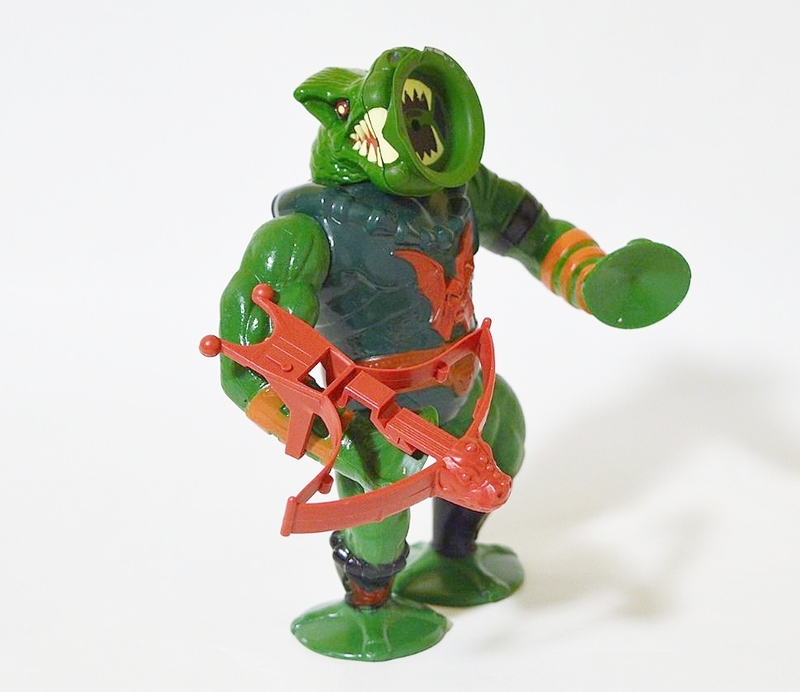 He left a big enough impression on me that he was the first vintage MOTU figure that I repurchased as an adult. 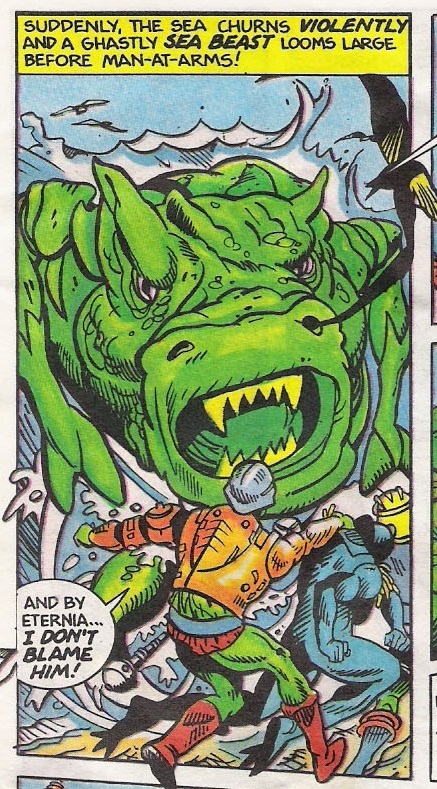 Mini comic images and Errol McCarthy artwork are from He-Man.org. Fond memories of Leech. He was bought for me as ‘this will stop him moaning while we xmas shop’ present. the prototype head has a number of differences, which given the front of the head being a second piece, probably means that bit was changed. the Suction cup is much bigger, mostly appears to be the rim, with much less mouth space as the two front teeth now come into contact with each other. the cup on the mouth has also been extended. yep, back onto the idea that the whole front section piece was changed more then the head itself. Thanks for the heads up Manic Man. I hadn’t noticed that – I’ve updated the article. 🙂 I don’t think the teeth are actually bigger though – on mine at least the sculpted teeth do not meet, but the white paint extends far beyond the teeth, giving the impression that they do meet. possible. I think I have Leech but all mine are in a box in the loft which I can’t really be bothered to check for a while ^_^.. and I think my Jitsu is affected by something which almost seams like Gold Plastic Syndrome.. (which is mostly Hasbro. from around the later 1980s, to early 2000s, the paint to plastic mix for Metallic plastics (most notably gold, but others too) wasn’t right, leading to the plastics being pretty brittle and snapping in half or in bits without stress marks. for some toys, it’s not a HUGE problem.. but for any toy which requires smaller parts and minor stress (again, showing my Transformer side), it’s a killer.. not as much a problem as when they first came out, but within a couple of years, some you won’t be able to buy mint in the box without major damage. my Jitsu seams to be showing similar damage on his boots.. but I haven’t been able to confirm either way (though broken, snaps into pieces without much pressure, no stress marks, swirl of paint visible where not mixed complete with plastic, seams to all but confirm the fact. I’ll be interested to know when you get to reporting on him.. probably looks like.. early next year..
Leech was always a guy I didn’t care too much for. I got him, as did my Brother. I think we ended up with 2 Leeches, possibly 3. He became sort of a dumb beat up throw away character. Oddly, he survived where tons of my other figures didn’t. It seemed from about 85-87 we’d end up with multiples of several characters because Aunts, Uncles and Grandparents would oddly buy me and my Brother the same figures. Which would result in those characters becoming less popular in our various lore. Leech was one of those. I got 3 Man-E-Faces for a birthday one year. Couldn’t complain though, since I could have a different face on each one. Really enjoying the in-depth look at a lot of these characters. I didn’t own Leech as a kid, but I can definitely see the appeal. I played with Leech a lot. In fact, I only really liked him and Hordak when it came to the Evil Horde. His bulkiness made him more powerful when I played with him. 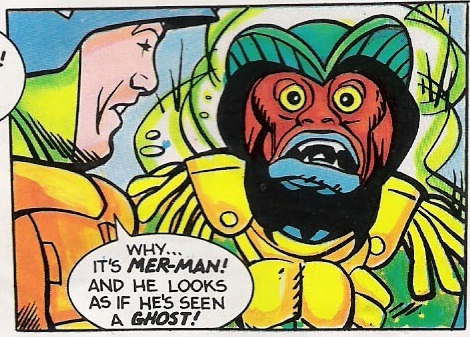 In my view back then, he was an newer, more powerful version of Mer-Man. Amazing how the decades go by, and Mer-Man has stood the test of time, while Leech is a footnote. I really do not like his mini-comic. The Evil Master of giving you the Succ. I really liked all the Horde figures from their debut year. 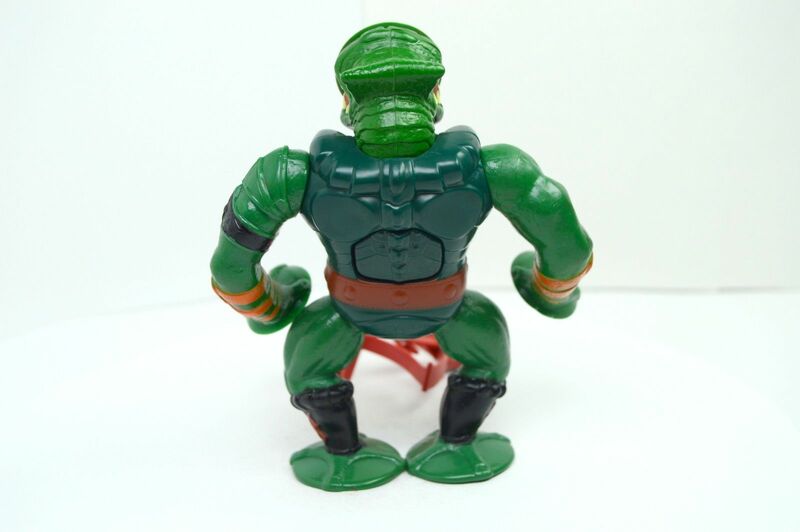 The lack of part re-use, and the sheer size of Leech, gave them a premium feel compared to most of the other MOTU figures. Even their (rather pointless) crossbows had unique sculpts! I really disliked Leech’s minicomic. This and Mantenna’s are probably my least favorite in the entire series. The minicomics that came with the original lineup of Horde figures were really all over the place in terms of quality.